In the 21st meeting of the 19th Undergraduate Senate on Tuesday evening, KZSU general manager Caleb Smith ’17 M.A. ’18 announced that he will file a Constitutional Council suit against the Senate on behalf of the Stanford radio station. Smith, who is also a Daily staffer, alleged that the Senate violated a section of the ASSU Constitution that requires the location, time and agenda for ASSU meetings to be made publicly available. Smith said that he should have been able to attend a meeting that determined the apportionment of funds recommended for KZSU between the undergraduate and graduate ballots. The ASSU recommended and approved a funding grant of just above $98,000 for KZSU for expenses related to equipment, labor, travel and more. In the April 12-13 election, the Stanford student body will vote to determine whether KZSU–and other student groups involved in the process–receive funding. For groups that involve both undergraduate and graduate members, an apportionment committee comprised of undergraduate and graduate student representatives meets to determine what percentage of the funding request appears on the undergraduate and graduate ballots, respectively, depending on the organization’s reach in both communities. In KZSU’s case, the apportionment committee determined that the undergraduate student body will vote on 60 percent of the funding, and the graduate students will decide on the other 40 percent. Smith told The Daily that this apportionment between the two student bodies is unfair because KZSU largely orients itself toward an undergraduate audience. Smith also said that but for the Senate’s failure to post multiple meeting times, he would have been able to make his case against the apportionment split. 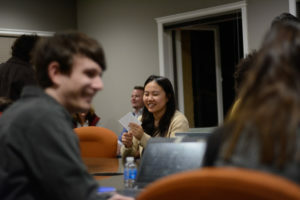 During the meeting, appropriations committee chair Gabe Rosen ’19 speculated that Smith complained about the apportionment decision because Smith thinks the graduate community–whose voice is now weighted more heavily in deciding KZSU’s funding– is apt to vote against funding the organization, perhaps increasing the organization’s chance of losing money. “Caleb in his personal opinion thinks that [the apportionment split is] unfair because he’ll lose an undergraduate portion and he wants to make sure that the undergrads take on more of the burden for KZSU,” Rosen said. Smith demanded that the package be “voided” due to Constitutional violations. Following his comments, however, the Senate voted unanimously in favor of the annual grants package. Smith said that he will invite other student groups to participate as co-plaintiffs with him in the suit. “If you proceed with the case, I look forward to seeing you in court,” Rosen said in the meeting. Following the meeting, Rosen declined to comment further on the situation because no specific charges have been brought before the Constitutional Council. The Senate also discussed the Campus Climate Survey (CCS) with biology professor Susan McConnell, law student Rachel Green J.D. ’19 and Director of Assessment and Program Evaluation at the Office of Institutional Research Brian Cook ’01, members of the committee managing the survey. The discussion was informed by and framed around a resolution calling on the University to abandon the CCS in favor of an alternate survey created by the American Association of Universities, which is slated for release next spring. This resolution was introduced last week but passed in this week’s meeting. “Students are more interested in having a robust survey that would accurately measure sexual assault rather than a survey done every three years,” McConnell said. Students who attended previous town hall meetings on the subject expressed interest in details about the frequency, locations and perpetrators, including information about forms of abuse other than physical violence. They also reported a general desire for open access to Stanford’s data as well as comparative results with similar institutions. “The AAU survey, in the form that it was offered in 2015, doesn’t actually address all of those issues,” said Cook. The committee managing the CCS believes that the AAU is effective in some ways, but neglects other students concerns. While committee members acknowledged faults in the previous CCS, they said that there are tradeoffs to abandoning a University-specific survey in favor of a more generalized sexual assault survey. “It doesn’t give us a lot of flexibility in terms of asking questions that are campus-specific, for example,” said Cook. He added that data from the current survey does not provide details on specific places where crimes occurred, and only uses the terms ‘fraternity’, ‘sorority’, ‘on campus”, and “off campus” to refer to their locations. Compared to the CCS, the AAU faced a smaller battery of questions on workplace harassment, an issue which is more prevalent among graduate students. However, committee members expressed their uncertainty as to whether or not the University could sufficiently modify the survey to suit the needs of all its constituent communities. The committee discussed the possibility of having two surveys — the AAU and a University-specific survey — each issued every couple of years. Contact Michael Whittaker at mwhittak ‘at’ stanford.edu and Courtney Douglas at ccd4 ‘at’ stanford.edu. Correction: a previous version of this article incorrectly stated that committee members working on the Campus Climate Survey recommended having two surveys. In fact, the committee has not made any formal recommendations or decisions, but merely discussed the possibility of having two surveys with the ASSU representatives. The Daily regrets this error. Correction: a previous version of this article incorrectly stated that the resolution calling on Stanford to abandon the CSS in favor of the upcoming AAU survey was passed last week. In fact, it was introduced last week, but passed on Tuesday night.